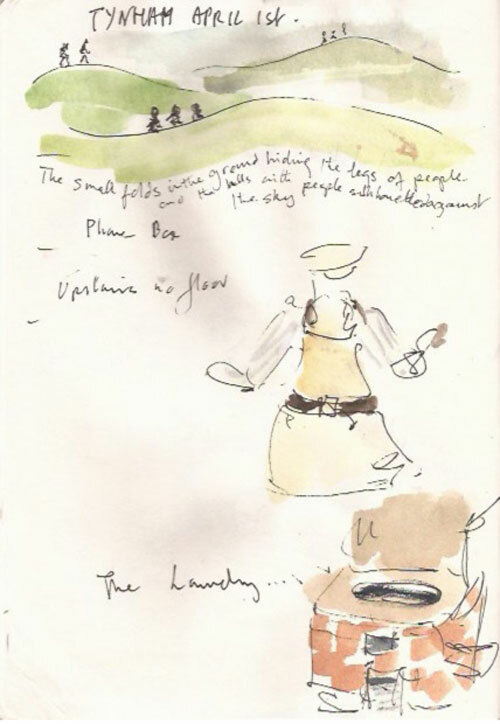 Last weekend we went on a research trip to the ‘lost’ village of Tyneham in Dorset with the designer Tina Bicat. We were drawn to the story of this village which had been requisitioned in 1943 by the MOD and whose inhabitants were only been given a month’s notice to leave - it was promised that they could return after the war. They left a note pinned to the church ‘Please treat the church and houses with care … we shall return one day and thank you for treating the village kindly’ – they were never allowed to return. In 1974, a group of villagers, led by John Gould, went to Downing Street to visit the Prime Minister – they took with them a wreath of ivy from Tyneham. He stated, ‘We remind those in authority of a broken pledge’. Despite many protests over the years, the village remained empty till it was finally decided to be opened to the public at weekends during the summer for visitors. The school house, farm and church have been renovated but the rest of the village is as nature has claimed it. 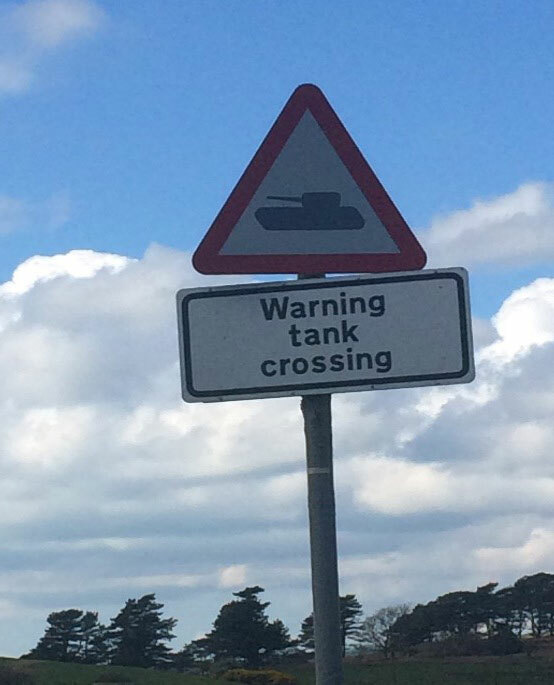 Outside of the villages ‘opening hours’ it is a live firing range, as you are reminded with signs claiming ‘Beware of Sudden Gunfire’ and ‘Warning tanks crossing’. We arrived on a beautiful, sunny Spring Saturday. It felt incongruous to the stories we had read and we imagine very different to the November day 73 years before when they would have been told to leave. Rather than a ‘ghost town’ as it has been described, the feeling was of a peaceful place at the bottom of a quiet valley, leading to the sea. We thought ab out home a lot. What does home mean to us? What would you do to keep your home? What would you give up? What would you take with you? We all brought one object that to us meant home, a cup, a painting, a photo, a necklace. 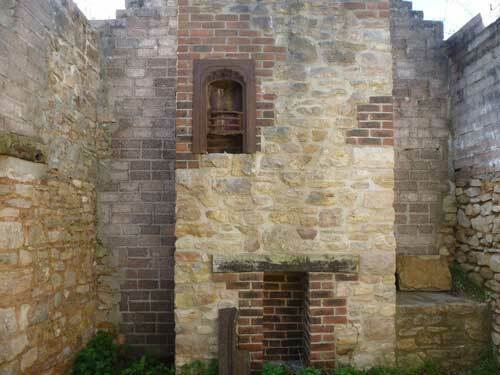 We felt drawn to some of the homes and not to others, one image that struck us a lot were the suspended fireplaces, where you could see the upstairs rooms as the floor had given way. It was also clear how the ceilings got higher the wealthier you were. The stories of some of the villagers allowed us to glimpse a trace of what life was like in Tyneham before the war – idyllic perhaps for the Bond children in Tyneham house who spent their days playing in the sea and gardens, putting on plays in the barn, but hard for those in the cottages who did the laundry and worked the land. We came back to a question we had asked ourselves in ‘1 Beach Road’ about the value of your home by an outsider, due to coastal erosion the houses in Happisburgh had been valued at £1, here in Tyneham the villagers were only given the value of what they had in their garden at the time as they were all tenants. One home that stuck out was the Gardner’s Cottage which was the first you saw as you entered the village and as such seemed like a sentry on the edge of the village – standing guard to protect, or continually waiting. It turned out to be the home of the Gould family whose son headed a personal campaign, to be returned to Tyneham. 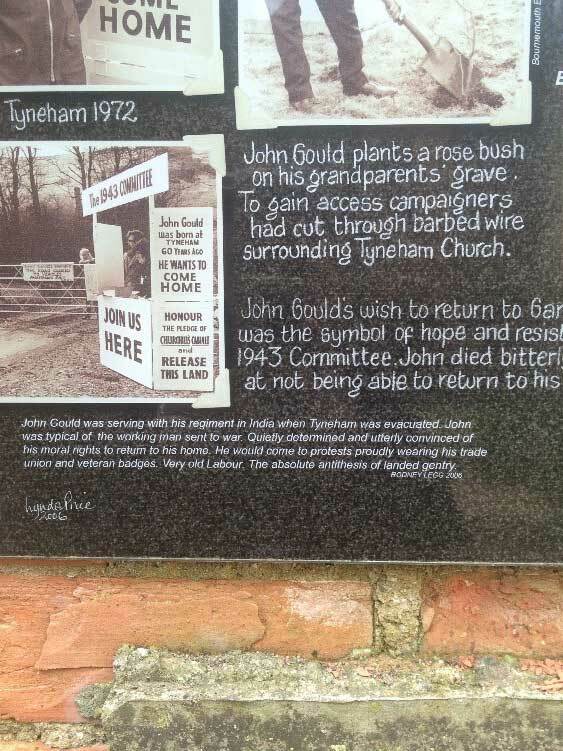 John had cut through barbed wire to plant a rose bush on his parents’ grave, and can be seen in the picture above in his one person protest booth that was situated at the military gates that barred the public to the village for many years. Lots to think about as we go forward… What happened to all the villagers? Did some reconcile and perhaps find better lives? Or as Tina Bicat asked, ‘Did everyone walk through a doorway into a different life? Who moved on with circumstance and who clung to a hope of return?’ Join the mailing list to be kept up to date. 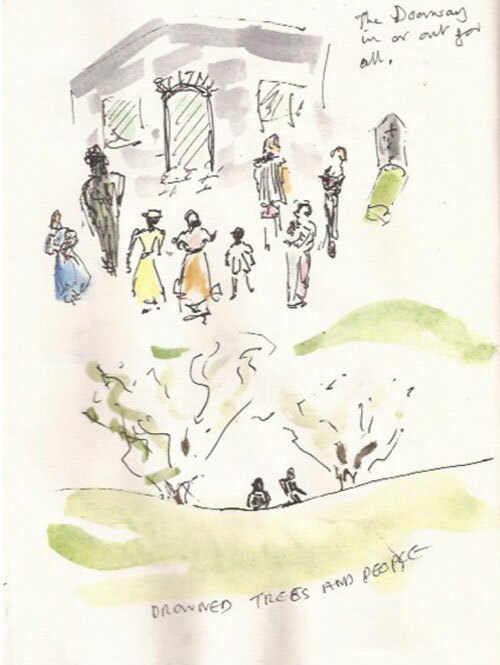 Did Algernon, Lillian and Ralph want Tyneham to be re-inhabited as much as Percy, Eileen and Fred? 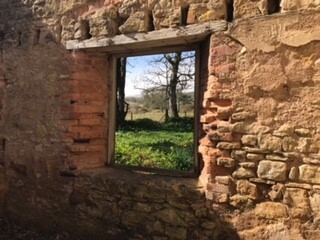 Something about the windows and doorways, empty now, dark and low ceilinged inside and such open country outside – winter must have seemed so long, muddy and dark- and the primroses and wild garlic of spring so lovely. Did everyone walk through a doorway into a different life? Who moved on with circumstance and who clung to a hope of return? The daily Tyneham life – not so much the agricultural work of the men but the daily housekeeping and garden work of the women; most particularly the laundry coming in a cart from the Big House to that Tynham Laundry Cottage and the boring, heavy labour of carrying, heating and draining water and scrubbing with hands sore with soda. And then it being returned, starched, ironed and folded for the smart maid, who perhaps had just rinsed out the Lady’s silk underwear in clean warm water from a tap, to put away in the cupboards of someone who had never washed a stocking. Was the evacuation, brutal and frightening, perhaps a doorway from that safe, familiar but restricted life to a more exciting world? Might it have given the women a chance of life that was more than housework and child-rearing –such long, hard work then with no running water, electricity, shops and little money - to a life where the daughter of the big house might share the same war-work of the girl brought up in the tied-cottage at Tyneham.